New Delhi, Jaipur, Ranthambore, Bharatpur, Agra, Bandhavgarh, Kanha, Jabalpur, Delhi. Arrival at the airport & transfer to the hotel with the assistance of the representatives from nature safari. Delhi is the symbol of old India and new ? Even the stones here whisper to our ears of the ages of long ago and the air we breathe is full of the dust and fragrances of the past, as also of the fresh and piercing winds of the present. - Jawaharlal Nehru. Delhi, the capital of India is the third largest city of the world, exceeded in size by Calcutta and Mumbai. Delhi is situated in north central India and stands on the west bank of Yamuna river. It is bounded on the east by the state of Uttar Pardesh and on the north, west and south by Haryana. The eternal Yamuna has witnessed the glory and the tumultuous history of the 3000 year old Delhi. Delhi is spread over an area of 1483 sq. kilometers, 216 meters above sea level and has a population of around 14 million. The amalgamation of various cultures, traditions, religions has painted Delhi in colour which are brought from all over India. Delhi is a true cosmopolitan city always on the move. Delhi remains the centre of power. Once it was a city of royal power. Then it became the seat of colonial power. Later it was the seat of bureaucratic power. The seat of political power it has always been. Today it is emerging as an important centre for corporate power too. It is a perfect introduction to the cultural wealth, the complexities and dynamism of India. Delhi has always been the hub of activity, art, culture and the history of the whole country and continues to do so. There are very intereseting palaces that one can visit apart from the Amber fort. Amer Palace Raja Man Singh erected Amer Palace in 16th century. It is a mesmerizing amalgamation of Hindu and Mughal architecture. Rajputs made use of this Amber Fort from the 16th century up to the foundation of Jaipur in 1727 both for defense reasons as well as the residential reasons. Thus within its powerful walls, one finds charismatic gardens and magnificent palaces made from marble and precious stones, richly festooned with intricate stonemason works and paintings, which corresponded to royal splendor and luxury.Situated at Jaipur, the mirror image of Amber Fort in the lake below looks almost divine. It is not at all surprising to know that this grandiose and stately fort was once the Capital of Minas. Amer Fort accommodates Jai Mandir, a famous temple which has Sheesh Mahal, a delightful hall of mirrors that are so artistically set that even a tiny ray of light gets replicated in the mirrors and illumines the hall flamboyantly. Sheesh Mahal is famed all over the world as one of the most sought-after tourist attraction. Other places of interest in this fort are Sukh Niwas and Ganesh Pole. City Palace A combination of conventional Rajasthani and Mughal architecture, City Palace complex has more than a few palatial structures. Maharaja Jai Singh built the external wall but there have been many additions since then. It stretches across one-seventh of the area of the walled city and is in part of the palace still serves as imperial residence. The tourist attractions of the palace are Chandra Mahal, Badal Mahal, Shri Govind Dev Temple and the City Palace Museum. The first courtyard of the palace accomodates the 'Mubarak Mahal' or the Fortunate Palace, built by Maharaja Madho Singh II contains the textile section of the Maharaja Sawai Man Singh II Museum. 'Chandra Mahal', or the Moon Palace, is a gigantic seven storeyed structure. It is also the present-day residence of the Maharaja of Jaipur and providing awe-inspiring views of both the gardens and the city. It is ornamented in a traditional style by floral decorations, paintings, mirror walls and ceilings. Nahargarh Fort Embraced in the Nahargarh Hills, the Nahargarh Fort of Jaipur was erected by Sawai Raja Jai Singh in 1734. Jaipur was the capital of Raja Jai Singh II and Nahargarh was an appropriate stand guard, rightly called the Tiger Fort. It was the first of the three forts built by the rulers of Jaipur. Though in ruins, there are pretty buildings that the fort holds, added by Sawai Ram Singh II and Sawai Madho Singh II in the 19th century, which have been well preserved. It offers some out-of-this-world views of the Man Sagar Lake and the city below. Attention-grabbing folklores ring in every nook and corner of the fort. A palatial duck blind stands with poise in the midst of the lake, which once allured the shooting parties of the regal family. It has also served as a private treasury for years and an imperial retreat for the queens. Not very far from the Amber Fort, Raja Sawai Jai Singh erected the Jaigarh Fort (translated as fort of conquest) in 1726. This earlier royal treasury in Jaipur is extraordinarily well preserved for the military structures of that period and is regarded as one of the three strongest forts of India. The fort perches on a cliff and is surrounded by mammoth fortification walls, which have inside pathways that offer astonishing views on all sides. It houses the World's largest cannon on wheel, Jaivan. Its ingenious planning is quite evident in its complicated water supply and storage system. Similar to Amber Fort in structure, Jaigarh Fort provides some extravagant views of Jaipur and Amber Fort from the Diwa Burj watchtower. There was tittle-tattle that there was a large treasure of gold obscured in the premises of the fort. Thus, it had to be preserved from the public for seven long years. Now, it has been opened to the public to put on show its several striking palaces, gardens, its granary, an armory that has a dazzling collection of arms and weapons and its temples. Erected to be a pleasure palace for the imperial family in 1799, Jal Mahal Palace (translated as Water Palace) of Jaipur is an exceptionally romantic place with its red sandstone elaborate architecture casting beautiful reflections in the unruffled waters of the Man Sagar Lake, which is full of hyacinths. Enveloped by Nahargarh Hills, Jal Mahal is known for its superb architecture and erudite design. It was once used for the regal duck shooting parties. It has also been abode to one of the prime ministers of Jaipur estate. Though forsaken, it is very well preserved and provides a quaint view from Nahargarh Fort. Set contrary to the cenotaphs of the royal family, the first four floors of Jal Mahal is under water and only the top floor is higher than the water level. The lake environment is a preferred home of a number of migratory and resident birds. The Mansagar Dam is to be found on the eastern side of the lake and provides a good vantage point for screening the lake and the valley. 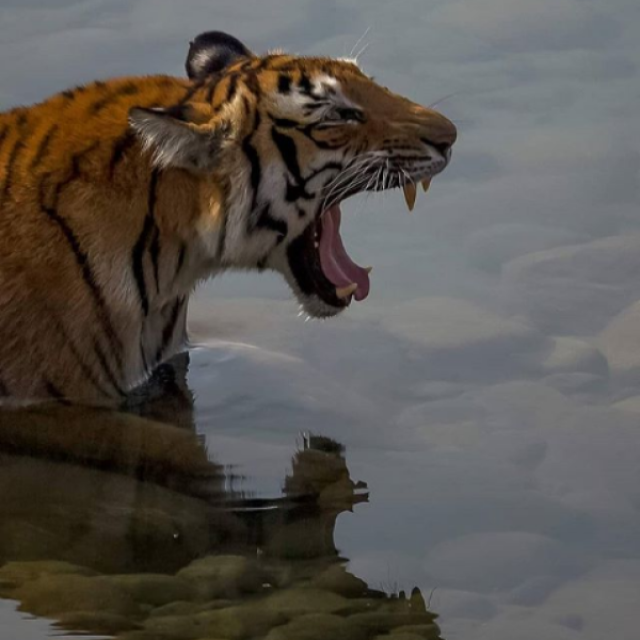 Ranthambore National Park is home to a rich and diverse collection of wildlife. The Ranthambore wildlife sanctuary is a nature lover's delight. Amateur and professional wildlife photographers will find many opportunities to take pictures of the rare and unique wildlife at Ranthambore wildlife reserve. 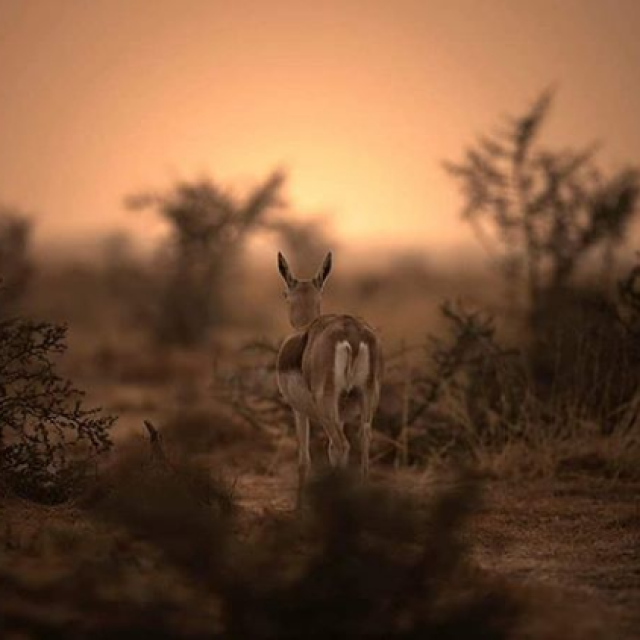 The dry deciduous forests and scrub jungle across the Ranthambore National Park provide the deer and other herbivorous animals in Ranthambore with enough greenery to graze on through the year. The herbivores form the prey for the predators of Ranthambore such as leopards and the impressive Royal Bengal Tiger. One of the finest bird parks in the world, Bharatpur Bird Sanctuary or Keoladeo Ghana Natiuonal Park is a reserve that offers shelter to faunal species as well. Nesting indigenous water- birds as well as migratory water birds and waterside birds, this sanctuary is also inhabited by Sambar, Chital, Nilgai and Boar. The area was declared a national park on 10 March 1982, and accepted as a World Heritage Site in December 1985.More than 300 species of birds resides in this small wildlife park of 29-sq-kms of which 11-sq-kms are marshes and the rest scrubland and grassland. Keoladeo, the name derives from an ancient Hindu temple, dedicated to Lord Shiva, which is situated at the centre of the park. Take an executive class air-conditioned train to Bandhavgarh Tiger Reserve. 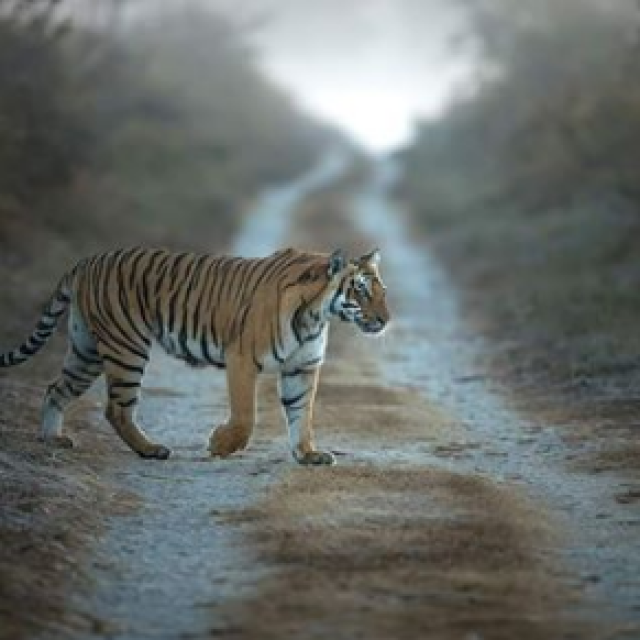 Though small in size, yet it is the national park known for its highest tiger population. The former hunting reserve of the royal family of Rewa; Bandhavgarh was declared a National Park in 1968 and further extended to the adjoining Sal Forests in 1986. The thick forest and Vindhyan Mountains surround Bandhavgarh National Park. Its plains have a number of grass and reed covered wetlands dominated by the Kingfishers and Egrets. The Bandhavgarh National Park. Covering an area of 542.40-sq-kms, Bandhavgarh Wildlife Sanctuary has 25 resident tigers and is noted for its tiger population. The fine trees of Sal cover half of the Bandhavgarh National Park while the higher hills consist of the mixed forests. The wide stretches of bamboo and grasslands cover the entire northern region. Whole of the national park is encompassed by 32 wooded hills. 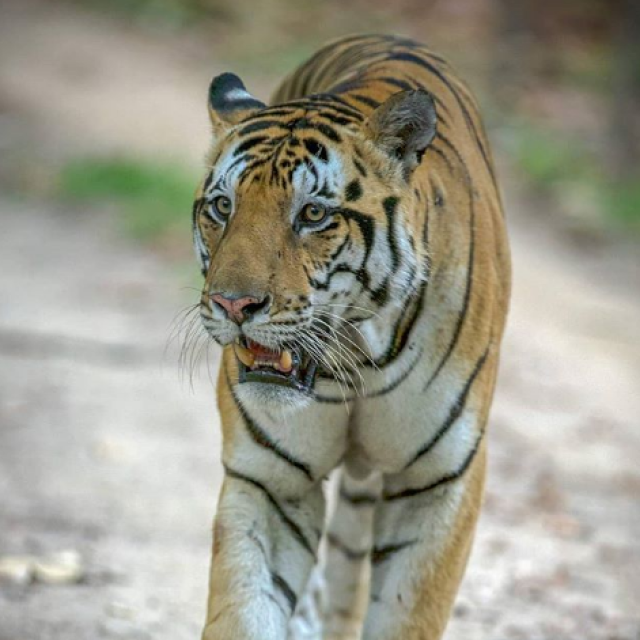 The Kanha National Park in Madhya Pradesh was conceived in 1955 and later in 1974, it got the status of a tiger reserve under the Project Tiger Scheme. Spread over an area of more than 940 sq km; the Kanha National Park owes thick vegetation made of sal and bamboo forests, grasslands and streams. The national park is the sole habitat of the rare species of barasingha.The Banjar valley and Halon valley forests form Kanha's western and eastern halves, and is quite famous for its deer and tiger population. It has the honour of being one of the most well-maintained National Parks in Asia. Bamni Dadar, the popular Sunset Point is the most beautiful section of the park to view the dusk.